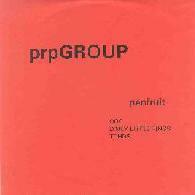 prpGROUP - "Babylard" / "Penfruit" / "Snib" / "Sun Pie In A Custard Sky"
prpGROUP is the trio of Cloughy, Riz and Ashley, who have been playing together since the early 1980's, originally recording as Rancid Poultry who were active members of the home taping underground. Rancid Poultry had been a quartet and prpGROUP represents Riz, Cloughy and Ashley's efforts to continue making music (prp... Post Rancid Poultry... get it?). Babylard consists of a trio of tracks that showcase prpGROUP in thrashy industrial tribal space mode. "Cascade" is a punkish song with almost Johnny Rotten like vocals. But the bashing, potent guitar patterns and spacey electronic effects remind me a lot of Finnish space-prog-kraut-post rockers Circle. "Tombola" features totally alien space atmospherics and effects, screaming and shooting against an industrial droning rock beat. The effect is like Chrome and Pressurehed meet Forbidden Planet. But about half way through the track a pounding tribal percussion groove takes over, accompanied by a fun and freaky synth dance, ending on a crazed power rocking note that's similar to "Cascade" but far more intense. Rounding out the set is "Ebola", which after a couple minutes of a minimalist noise patterns, prpGROUP's seemingly trademark blazing percussion kicks in with heavy doses of industrial thrash. 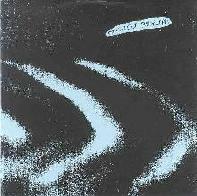 But things quickly ease up and we get into space mode with haunting screechy guitar and bubbling synths. And back and forth we go. The intensity level is once again way high, but I'd say "Cascade" and "Tombola" were the winners of the three for me. Penfruit opens with "QQG", a short piece that begins as an industrial noise sculpture but soon launches into a quirky rocking avant-prog construction. Imagine a more punk-thrash version of Massacre's Killing Time album. I was disappointed when the song ended at less than three minutes. But "Dinky Little Rings" isn't all that different, though it gets way more into a dancey, robotic, new wave-ish space rock realm, and there's also the dense and intense industrial rock that seems to be common to the prpGROUP sound, as well as some of the more complex and interesting proggy variations heard on "QQG". "TCHDS" is a killer 9 minute prog-space-punk rocker that blends that Circle sound I described earlier with a lot of really difficult to describe Faustian fun and spacey zaniness. Yet it all flows and transitions very nicely, creating some very haunting but interesting atmospherics and giving the attentive listener much to absorb and digest. 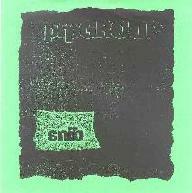 Snib is a 6 track set, with the first 3 songs listed under the category Punk Raut and the next 3 listed under Pun Kraut. "Electraumatic" and "Squealspatter" are pounding off-kilter rockers, the former featuring wild electronics. "Korguemorg" is slower on the rhythms but with equally prominent and far more spacey electronics. "First" sees prpGROUP taking off into more exploratory space realms, though a throbbing beat keeps things firmly rock oriented. "Class Schmaltz" is a too brief eerie keyboard piece that doesn't really go anywhere. And "Purple View" is an interesting Faust styled avant-garde Kosmiche tune. Sun Pie In A Custard Sky consists of a single 17+ minute track that sees prpGROUP delve even deeper into tripped out prog rock territory. Mid-70's improvisational King Crimson is an obvious influence, though once these guys really get crankin' we hear shades of Amon Düül II and Ash Ra Tempel as well, with a myriad of thrash and experimental ideas scattered about. In more contemporary terms, avant-space instrumental outfit Escapade comes to mind too. The band rock hard, the music is mucho cosmic, the atmosphere is dark and intense, the feel is loose and completely freeform exploratory, yet the musicians travel in a consistently linear determined direction. This is my hands down favorite of all these discs and I give it a big thumbs up to fans of improvisational spacey progressive rock with an avant-garde edge. Lots of great stuff on all these discs and I'm glad I had the lot to hear together. Now I'll have to seek out some Rancid Poultry recordings so I can hear what preceded prpGROUP. 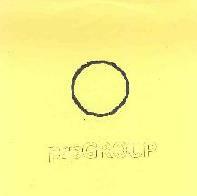 For more information you can visit the PRP Group web site at: http://www.prp-group.co.uk.